Designed with simplicity and versatility in mind, IPS e.max is the ultimate in metal-free esthetics and durability offering high-strength materials for both the PRESS and the CAD/CAM technique. No matter which technique you choose, all components are available from one manufacturer. If you prefer to work with the PRESS technique, two different types of ingots are available: IPS e.max Press, a high-strength glass-ceramic and IPS e.max ZirPress, an esthetic glass-ceramic which is pressed onto zirconium oxide in a fast and efficient procedure. For CAD/CAM applications, either the highly esthetic IPS e.max CAD ceramic glass blocks or the high-strength IPS e.max ZirCAD zirconium oxide can be selected, depending on the case requirements. The nano-fluorapatite layering ceramic IPS e.max Ceram completes the all-ceramic system. This material is used to veneer all IPS e.max components, no matter if they are glass-ceramic or zirconium oxide. IPS e.max Press are biocompatible lithium disilicate glass-ceramic ingots. They offer the fit, form and function which is expected from pressed ceramics. In addition, they offer improved flexural strength (400 MPa). With optimized esthetic properties creating all-ceramic restorations that offer true-to-nature results has never been so easy. IPS e.max CAD unites modern processing technology with a high-performance material. The lithium disilicate glass-ceramic is manufactured in an innovative technological process, unique in the dental industry. The glass-ceramic is processed for the laboratory in a crystalline intermediate phase. In this “soft” state, the material exhibits its unusual “bluish” color and strength of approximately 160 MPa. In this “blue” phase, the restorations can be manually adjusted or cut-back in a fast and efficient fashion. IPS e.max CAD acquires its final strength of 360 MPa and the desired esthetic characteristics, such as tooth color, translucency and brightness, during a simple and quick crystallization process. IPS e.max ZirPress ingots ideally combine the PRESS and CAD/CAM technique. Take advantage of the accuracy of fit as well as the strength of zirconium oxide-reinforced restorations. The fluorapatite glass-ceramic ingots are used to press onto IPS e.max ZirCAD frameworks. 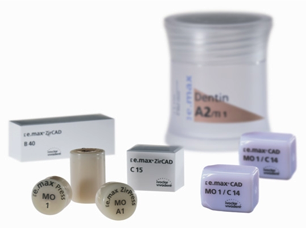 IPS e.max ZirCAD frameworks are either veneered with IPS e.max Ceram or IPS e.max ZirPress is pressed onto them. The specially developed ZirLiner, zirconia liner establishes an optimum bond, no matter which technique you choose. Due to its excellent final strength, IPS e.max ZirCAD is the material of choice for indications where high strength is required, e.g. posterior bridges. IPS e.max Ceram is the connecting element between the different components of the all-ceramic system. You now only have to use one layering ceramic, which will enable you to achieve highly esthetic results on glass-ceramics as well as zirconium oxide. © 2011 Creative Smiles Inc.